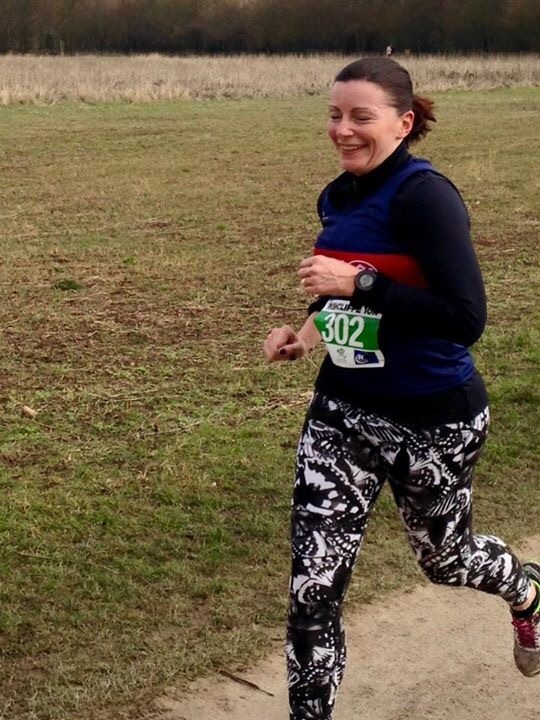 An action packed Mothers Day started with my annual pilgrimage to the Rushcliffe 10km, the first ever race of my running journey, always the first of my running season and now year 7 of my ‘streak’ to see how many consecutive years I can run it for. 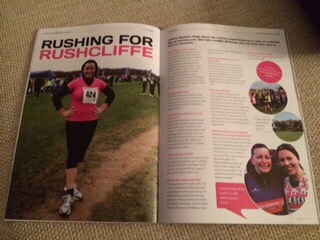 New publication RunABC Midlands had picked up the story so I did a piece for them on the event, yet sadly they didn’t give them out on the day. Worse still, they took an old (fat) picture of me on my journey… Why oh why not use the one from last year when I’m 2 dress sizes smaller than this ……. Cringe !! 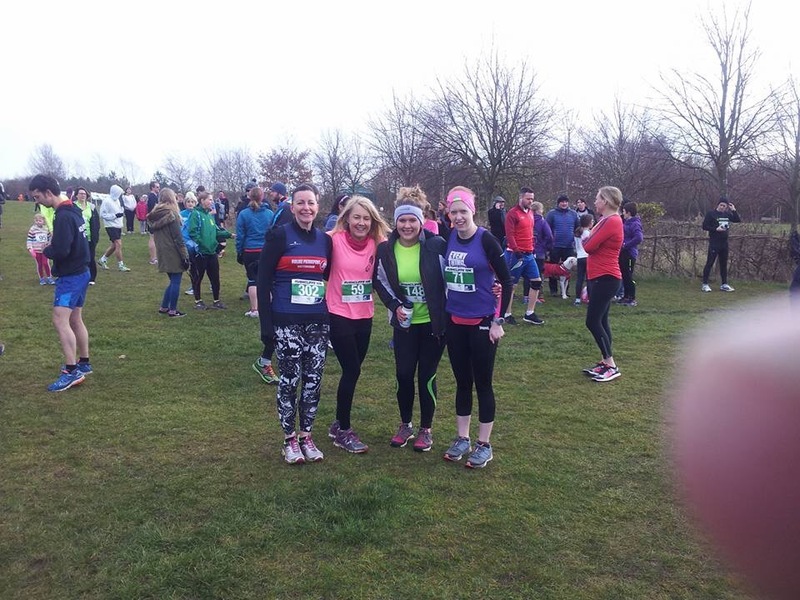 RunABC Midlands – look who’s talking! It was cold but dry, soooo much better than forecast a week ago, it could have been snowing. The event was full, which is around 750 runners as the narrow paths can’t accommodate more. It’s a mix of club and fun runners, not too serious but full of folk I know. HPP were out in force, all their great female vet runners were there ( which in this race is 30+ just to make you feel old ). I seriously thought about not wearing an HPP vest, as I haven’t been out with them , or anyone really and I just wasn’t feeling at my running best. But hey, it shouldn’t be only about performance to run with a club, it’s just that they’re so bloody fast! My ‘frival’ was there too, JW aka ‘purple vest’ in my other blogs. JW is currently on fire, nearly at the end of a 100 day streak and gone from struggling to go sub 50 minutes in a 10km last summer, to finally getting there and then smashing it. I knew there was no point lining up together as I normally would. Not without risking a coronary……I was right, JW PBd yet again, a time with 47 in it ( gulps in amazement). I like to think the ‘frivalry’ helped. I was there, behind, but there……nothing like the incentive of being chased by a ‘frival’ to help you keep the pace up ! The purple army of Notts Women Runners were there too, crazy Kelly in fluorescent pink raring to go plus a few other faces I recognised. Lots ladies were there for their first 10kms and couldn’t disguise nervous faces. Kelly’s patient hubby was braving the cold too, my own family, Mother’s Day or not, now too jaded by my running to leave the warmth of the house and come and support. Still, my buddy Mena gave up her Mothers Day chill out to come to the start. That’s 7 years in a row, in every weather she’s been there! So what is it about me and a race number. I was hoping for about 53 minutes as I know I do better ‘on the day’ . My fastest 10km since November has been about 55 minutes and I’ve been keeping the running up but not really training. I haven’t run with HPP since the summer and haven’t been bothered to get to Park Run for weeks. I still chose a spot in the front half of the line up ( you have to reach the first bend before a crush ) and I settled in with a suitable group. Quick, but nothing I couldn’t handle. When I train alone , quick for me is an 8.5min mile, I tend to settle at about 9.2. Yesterday, mile 1 = 7.5!! I can’t run that fast, how does that even happen? More of 7.5 minute miles followed although mile 4 dropped to an 8.1, but I picked back up again when I saw an NWR purple ahead. That was my target, catch up and stick at the pace. We spurred each other on over the last 1km but I pushed for a sprint finish, I always find one no matter how hard I push the rest of the race. Digging deep is a speciality. Final time 49.11…………it’s identical to last year’s 10km PB which took me all season to get. It’s a Rushcliffe 10km PB. Seven years run, quicker every year so far…..I can’t keep that up forever. A 7.5 minute mile is not a pretty sight ! How? Where does it come from? I can’t run that fast. Tonight, enthused by my speed I went out and pushed it. 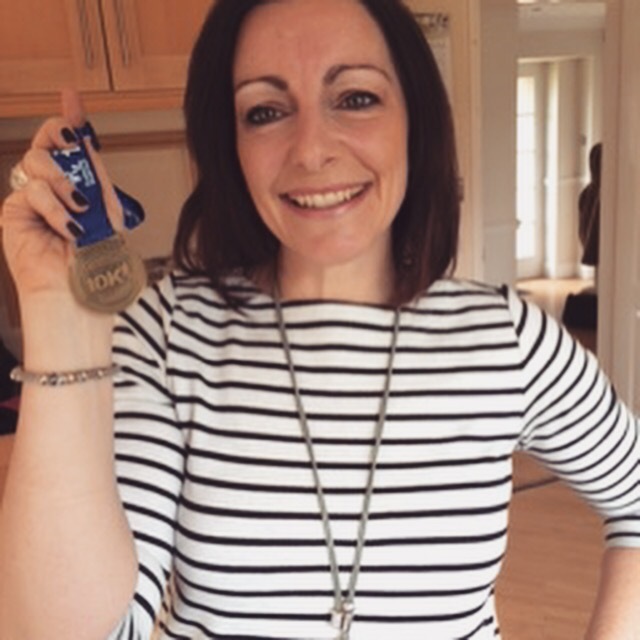 It felt fast as I ran along the main road….mile 1, just 9.1 minutes ……..what’s my issue? no race number !! I like to pack lots into a day so sadly I crossed the line and carried on running…….to my car. It’s such a shame not to cheer others in and there were so many people I knew I never saw and would love to have chatted to. But it was Nonno Dante’s 90th birthday with a table booked at 1 for 12 of us. My next PB was 35 minutes from sweaty to gorgeous! Of course I’ve wallowed in the post race stats. My favourite is coming 27th out of 283 vet ladies. I really need them to split out the vet categories more, get those spritely 30 somethings out of there and let’s see where I rank amongst the true LCAs. Still today Public Health England announced the importance of 40-60 year olds being fitter to help in their old age…….well check that time out, I better become one healthy old dear! ‹ Race ready? Hell…………maybe ! Congratulations on your most impressive run which was a fitting prelude to a very happy and enjoyable Mother:s day.